As can be seen this is set 2 named after Pickett's charge, and a brief summary of that action can be found in our review of Set 1. In fact much else in that review can also be applied to this set, because it is very similar in makeup, and shares many of the same positive and negative attributes. Most obviously, this set has a large number of figures in quite similar poses, walking forward with musket held up and forward, as if advancing. That makes perfect sense, and gives more of a feeling of immediacy than the first set, where the muskets rested on the shoulders. Various small differences distinguish one pose from the next, but here again we felt some were much less successful than others. In particular, several of the man are holding their musket with both hands down by the lock, which is a very uncomfortable way to hold it, gives you very little control over it, and confers no advantage at all to the man. The advantage lies entirely with the sculptor, who does not have to deal with the difficult left arm, which could easily shield part of the figure from the mould. Some here do have their left hand in a reasonable position on the barrel, but clearly it is a difficult pose to do well when the musket is being held forward of the body rather than across it, so the poses vary considerably in terms of how natural and believable they look. Add to that the issue that every single man has the same foot forward, and a body of men made up solely from these figures would not look particularly convincing. There are four other infantryman poses, one with his hands in the air and three casualties. All these are pretty good, although the man apparently suffering a hit to the head is a bit flat, yet he gives a better impression of having been hit than several other such poses made by other manufacturers. The two figures on the ground are particularly appropriate because after an advance such as that of Pickett’s Virginians, the ground would be littered with such men, dead and wounded. The three command poses here are fairly conventional in many ways, but useful all the same. The flag-bearer is fine, but the drummer is remarkable for having his drum on his right side. We have never seen any contemporary image, modern reconstruction or re-enactor hold the drum this way, and that is probably because it never happened. Naturally when drummers were lined up, as they often were, all the drums had to be on the same side, and that was always the left, suitable for right-handers. So normally they would have had no choice, and we doubt whether any drummer would have taken the trouble to switch sides in the field for the sake of comfort. Also this man holds both sticks vertically above the drum, so certainly is not playing it. In short, a real mess of a pose with nothing to recommend it. The officer on the other hand is a great and dramatic affair, holding his hat as he points with his sword. Not a pose you see very often, but we really liked it. The Confederate forces started the war with a huge range of clothing, mostly state-supplied and often civilian in origin. By 1863 and Pickett’s charge things were more uniform, but there remained plenty of variety which has been amply reflected here. There is a mix of long frock coats and short jackets, fatigue caps, peaked and brimmed hats, and a wide assortment of kit. No one has a pack, but some have a rolled blanket across the chest, others haversacks and some of the usual kit items. Individual choices like the knives and pistols some carry are nice to see, and one man seems to have a length of material tucked into his belt for some reason. The net effect is quite untidy but eminently believable, and we found nothing here which concerned us. The officer is much smarter, wearing a non-regulation single-breasted frock coat and a sash under his belt, which happened but was not common on campaign. The sculpting of this set matches well with the first, which is to say fair proportions but a certain rough and sometimes indistinct feel to it. These are not the chunky Strelets figures of old, but some items like knives and sword scabbards are still quite fat and so ill-proportioned. Detail is reasonable, although this is not a subject that calls for large amounts of fine detail, and faces are quite good, however many of the hands leave a lot to be desired. There is flash in a handful of places, and all the mould lines have a slightly rough look to them. One feature of the first set has been duplicated exactly here too, and that is the flag. 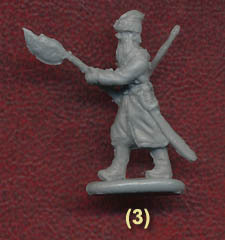 Again this example if about 12mm square, so really much too small to be any serious infantry or state flag. Some lesser flag might be depicted, as many smaller flags were carried at various times, but we would prefer a full-sized regimental flag, although the pose makes it easy for customers to substitute their own chosen flag, which we know happens a lot. So this set is a good match for Set 1, both in its good and bad points. We didn’t care for some of the poses, of which the drummer is certainly the worst, but accuracy is good and while not of the same quality as civil war sets from Accurate and others, at a distance these figures could mix successfully with those. There is enough here to interest the many fans of the civil war, and certainly this offers some new poses not done before, but there is still some way to go in terms of sculpting quality before this set would rank with the best.